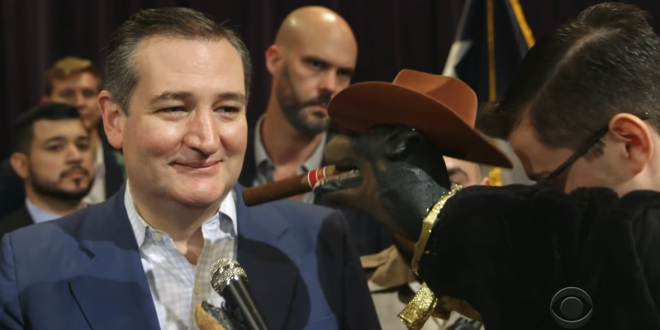 Triumph The Insult Comic Dog Meets Beto And Cruz - Joe.My.God. He ribbed Cruz harder than O’Rourke, but Cruz also made more of an effort to join in on the insult comedy, to mixed effect. “Just remember, it wasn’t the Republicans, it was the Democrats that took you into the vet to get fixed — and there is freedom on the other side,” Cruz told the dog puppet. “I support spaying and neutering, just like Trump did to you,” Triumph shot back. Cruz laughed and the interview was over. But Triumph wasn’t done — he got the Cruz crowd to shout “Lion of the Senate,” which got shortened to “Lion” and then “Lion Ted Cruz.” Get it?